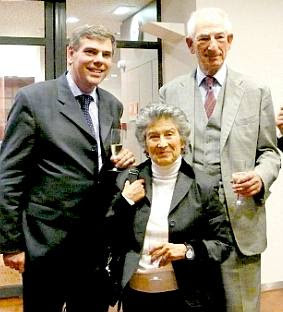 Henrik Ræder Clausen of Europe News has written the following essay to honor the memory of David Littman, who died last Sunday. It's been less than five years since I first met the classical Jewish intellectual David Littman, and it is with great sorrow I now hear that I shall never again enjoy his razor-sharp criticism of the moral decay of the United Nations, of the dhimmification of Western authorities, nor his eloquent quoting of Shakespeare, not to mention his loving words to his wife and lifetime ally, Gisèle Littman. 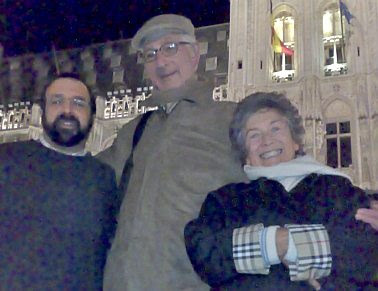 My first encounter with David Littman was a now-legendary conference in Brussels, where he presented a paper entitled “Creeping Dhimmitude the United Nations”. Here he presented what then seemed obscure information about Islamic anti-Semitism and the “Cairo Declaration of Human Rights in Islam”, pointing out that these problems were not being addressed by the UN at all, in spite of the original intentions of the organisation. 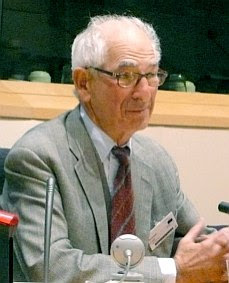 At that point, David Littman had become the “Lone Wolf” at the United Nations’ Human Rights Commission (later Council), speaking on behalf of the World Union for Progressive Judaism wupj.org, repeatedly lashing out against the systematic corruption of the founding ideals of the United Nations. This was most vividly expressed by letting the worst human rights violators chair the very organisations that should be policing them, effectively disarming these bodies’ ability to speak against the severe and extensive racism and human rights violations that still take place in the Arab world and elsewhere. To find the defining moment in the life of David Littman, however, one needs to go back more than half a century, to Operation Mural. The state of Morocco was using its newfound sovereignty to crack down on the Jewish citizens in the country, and Mossad, the Israeli intelligence agency, was seeking ways to protect the Jewish populating, preferably through facilitating clandestine immigration to Israel. After a capsizing accident with the ship Egoz, the agency was looking for new ways to protect the Jews. That help came in the most unlikely form of David Littman, who had just read “The Rise and the Fall of the Third Reich”, and had been searching for opportunities to do something meaningful to help Jews, anywhere. Tall, awkward and very visible, David Littman was possibly the least likely secret agent anyone could envision. Yet he and his wife Gisèle undertook the difficult task of smuggling Jewish children out of Morocco, with their final destination Israel. Working through pretences, challenges and weird coincidences, David managed to rescue 530 Jewish children directly. Further, and a few months later, the government of Morocco gave in, and permitted unlimited Jewish emigration from its lands. This is documented in the movie Operation Mural, which was freely distributed in 2011 and can now be viewed on Vimeo. Fortunately, more opportunities to encounter David came up, in particular at the 2010 Hudson Institute “Vienna Forum” conference in Vienna, Austria. In his speech at that conference he detailed how the 57 countries of the OIC are attempting to impose a Sharia-compliant perversion of “Human rights” on their citizens, diametrically opposed to the Judeo-Christian inspired Universal Human Rights originally endorsed by the United Nations. At that time I had the wonderful opportunity to accompany David and his wife Gisèle for a day in Vienna, visiting the Jan Sobieski Church overlooking the city, as well as several Viennese palaces and churches. On a day like this the formal façade falls away, and intellectual playfulness manifests itself, interacting with whatever the surroundings offer, such as competing in quoting Shakespeare with Robert Spencer (who usually had to admit defeat quickly). After those days in May 2010, I had the opportunity more frequently to discuss matters with David, concerning articles and videos to be published. Ever the perfectionist, David would keep working on matters until they were perfectly right, open to suggestions but never to imperfection. On this day, after having lost a unique personality, a friend and a ally in the fight for classical human rights and liberty, one could be burdened by the sorrow of never again meeting a classical intellectual like David. However, hope does spring eternal, and new individuals and organisations are growing to replace those who fell. Organisations such as UN Watch and HonestReporting are undertaking important tasks to expose the corruption of the UN and discreet anti-Semitism, respectively. They are making an increasing impact in the battle to keep the United Nations and the press honest, while bloggers worldwide are standing for freedoms under threat from Islamic fundamentalism and moral corruption. I am confident that David Littman, if he were 30 again today, would join the Internet-based struggle for human rights, liberty and freedom. Of course in his unique, intellectual manner, and preferably with his beloved Gisèle by his side. May the memory of David Littman be larger yet than he was in real life.